It's easy to argue for other models on value and fuel economy, but the 2012 Golf is an exceptionally well-made vehicle, a pleasure to spend time in and to drive, and worth the rather hefty up-front investment. 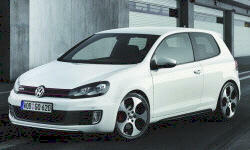 Why the 2012 Volkswagen Golf / GTI? It's hardly a secret at this point that, whatever else VW has done with its U.S. models, the Golf is exceptionally refined and well-made both inside and out. Materials feel luxurious, especially on the dash; you really have to search to find a hard or flimsy piece of plastic. VW even bothered to cover the seatbelt fasteners with some kind of faux velvet. The seats are comfortable and sporty, and they look about as good as cloth can look - with a kind of textured stitching that also serves to keep you from sliding around. I've put 25K miles on the car and the seats are still as springy and firm as when I bought it. Perhaps best of all, the doors (at least on my 3-door version) are weighty and shut with an extremely satisfying thunk. This car feels far more luxurious than its price would suggest. The 2.5L inline-5 is pretty ubiquitous in Volkswagens today, even though its days are supposed to be numbered. Despite its odd cylinder count, it has been around for a long time and, in a car of this size and class, it is very responsive and the 170-odd lb./ft. of torque get it moving quickly to pass or merge onto the highway. This car will genuinely accelerate in fifth gear, which gives plenty of confidence to the driver. Things do get rather less exciting as the tach rises, though - it's not a performance model, but it is far more than just adequate for a commuter vehicle. Journos inevitably malign its engine note, and it's certainly not going to turn any heads, but for my money it's less annoying than the buzz-saw whining of lots of economy four-bangers. Oh, and it's easy to find a manual transmission, which has a light, long-travel clutch with a weighty, satisfying shifter. Perfect. The styling inside is very functional, simple, and nowhere over-designed. A strip of faux-metal wraps around pretty much the entire front cabin, and it looks rather better than it sounds like it would. Everything else is pretty much black, livened by attractive (mostly red) backlighting and the white textured stitching on the seats. It is sober and timeless, which won't appeal to everyone, but if you like a car interior that is easy to use and totally free of gimmicks, get this one. The central European, high-quality restraint is great to live with on a long commute. The car is not old, but so far, so good. Oil changes are required only every 10K miles at first, and the first three are taken care of - not a high-price incentive, certainly, but a nice touch. I haven't had a single cause for alarm so far, and the car operates as it did on the day I bought it. VW has an iffy reputation in the US right now, but it's also said that quality control is best in Wolfsburg, where this car is assembled, and for what its worth, Consumer Reports ranked the MK6 Golf well above average for projected reliability. This is a front-wheel drive compact hatchback, so as long as you have reasonable expectations, you won't be disappointed (track-oriented people can opt for a GTI or a Golf R, and the TDI has a sport suspension as well, but at a huge price premium). The body will roll a bit in a turn, but braking is good and solid, and the ride is firm but velvety - nothing squishy about it, but even broken pavement won't rattle your bones. Steering has a very nice weight to it, and with the Golf's great visibility and lack of an overhanging trunk, it's very easy to maneuver into a parking space. Why Not the 2012 Volkswagen Golf / GTI? Honestly, this isn't terrible - I do a lot of highway driving and my trip computer has registered up to about 40 mpg (which may be optimistic, but its usually closer to 35). This is the (admittedly small) price you pay for a five-cylinder engine with lots of torque and great top-gear acceleration. In light of the exaggerations other small-car makers have promulgated lately, the Golf doesn't look horrible. But it does make fuel economy numbers that would've been good five years ago, and it's easy to do better now. There is no comparison to a hybrid or a diesel, for sure (but these all cost at least 5K more). The base Golf is more about quality and simplicity than tech, and that's how I like it. For about 18K, you get a CD player, an auxiliary input, power windows, heated power mirrors, cruise control, a trip computer, a manual transmission and three doors - everything else, including the DSG, costs more (unlike most U.S. automakers, VW's manuals are really on dealer lots and not theoretical constructs meant to advertise lower base prices; for me, that's a good thing, but few Americans agree). For those besotted with Bluetooth and navigation, this will not be enough, and plenty of competitors offer more bells and whistles at this price point. But if you're looking for an excellent experience without distractions, you certainly have found your car. I mentioned earlier that the Golf is still assembled in Wolfsburg, Germany, and hasn't been moved to any of VW's new world plants. This might be a mark in its favor vis-à-vis quality control, but the Euro-dollar exchange rate is not your friend on this model. 18K is a steep base price in this segment (although, to be fair, you often have to step up to some kind of "sport" trim line in other cars to get remotely competitive refinement). Things only get worse from here, as the jump to a GTI or a TDI is quite brutal. But if you just remind yourself that you're buying into the cheapest European car to be had in the United States, a car of exquisite refinement, I find that the sting goes away very quickly!